new leaves spring forth undeterred. So beautiful! And I learned something, too. Double-win for me. Thanks, Sarah. Wishing you all a lovely week. Snails are fascinating, the way they seal themselves into their shells in the winter. Some are less lucky. I have another picture of a shell lying on its back in the same flower bed, full of water and obviously devoid of its occupant. Wishing you a lovely week, too, Leigh. I was going to comment I wonder where snails went in the winter. Yes interesting that seal themselves in their shells. I have a love/hate relationship with snails, so I’ve learned all sorts of random facts about them. …What’s the expression? “Know your enemy” or, in my case, my garden’s enemy! All I know is about slugs. My sister and I would take turns pouring salt on them for my grandmother to keep them out her garden. I had no idea they could survive the winter or hibernate. I wonder if they would survive in this climate. Hmm. The worms have come out into the upper soil here recently, but they’ll no doubt be going back far underground as we’ve got a cold spell and possible snow on schedule for the middle or later of this week. Hope your sidewalk is all walkable again. Thanks, Sarah! 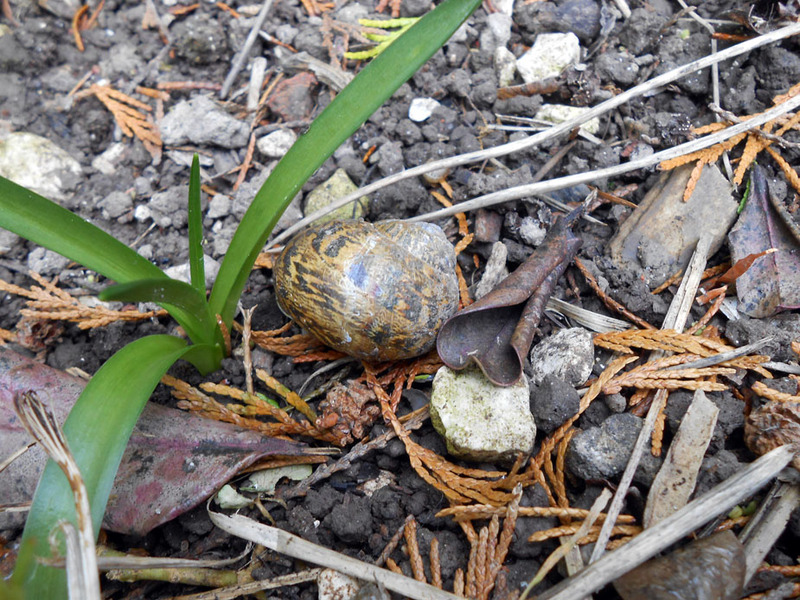 Snails usually hunker down under leaf mulch, so they’re fairly snug. I’m guessing that the one in my photo had temporarily come out of hibernation when we had an unseasonably warm snap and just resealed its shell without seeking out further cover. I think snails would survive in your climate. They’re fairly resilient, except when it comes to assault by birds, slug pellets, or wellie boots!